Can dogs eat celery? The answer is yes they can. In fact, as long as you feed them in moderation, celery can be a great addition to your dog’s diet. The list of benefits that celery can have is long. Celery is high in nutritional value as it contains calcium, potassium, phosphorus, sodium and iron, and vitamins A, B, C.
Celery contains pthalides – these help to lower blood pressure by relaxing muscles around the arteries that in turn allow vessels to dilate. The pthalides also lower cholesterol by increasing bile acid secretion. 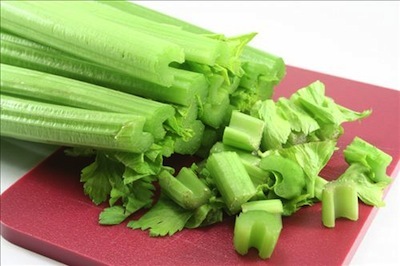 Nutrients in celery fiber are released aiding bowel movements. Celery juice can help dogs with arthritis or joint pain. The vitamin C in celery helps keep a healthy immune system. Celery is a natural diuretic. When consumed by your dog it will stimulate urine production, flushing out toxins and aiding good kidney and urinary health. Many foods lose nutrients when cooked. However, most of the useful compounds found within celery remain after it has been cooked. A good tip for preparing celery before giving it to your dog as a treat, is to process it into a juice. This makes it easier for your dog to absorb the many nutrients contained within. You can also cut it into small pieces for easier digestion. For extra caution, you may wish to string the celery before feeding your dog. In very rare cases the string may cause intestinal blockage. Can Dogs Eat Celery – Any Precautions? As with any type of human food that you want to feed your dog, you should ensure you do not give them too much. If fed in high quantities it can lead to your dog having an upset stomach. Also, if you are giving your dog celery for the first time, do so in a small amount. If you introduce the food into the dogs diet slowly, you will be able to watch out for any adverse reactions. A change in a dogs diet is the biggest cause of an upset stomach, so approach any such change with caution. As already stated, in some cases you may wish to remove the string within the celery before feeding. There have been cases where the string has led to an intestinal blockage. To be on the safe side, creating a juice from the celery is a good step to take. For an interesting article on why celery reduces blood pressure head here. Read more about the phthalides contained in celery here. Web MD – Top 5 issues facing American pets today. Can dogs eat celery? If you have any comments on your own experiences with feeding your dog celery please leave them below.